If your garden is also at the height of tomato glory then this recipe is for you. I feel like typing, set it and forget it, because this guy is so easy. Basically your only prep work is washing your veggies and maybe cutting some in half so they fit in the pot! This is the kind of sauce that can handle a myriad of additions. Great way to utilize leftover veg purees or bits that you might save for stock. I added in 1/2 cup of leftover carrot puree and 1/2 cup of leftover spinach puree. A handful of sundried tomatoes finished this off for me, but the sauce is bright and lovely just as it is. The bottom line is that you can and should make this your own with what you have available. 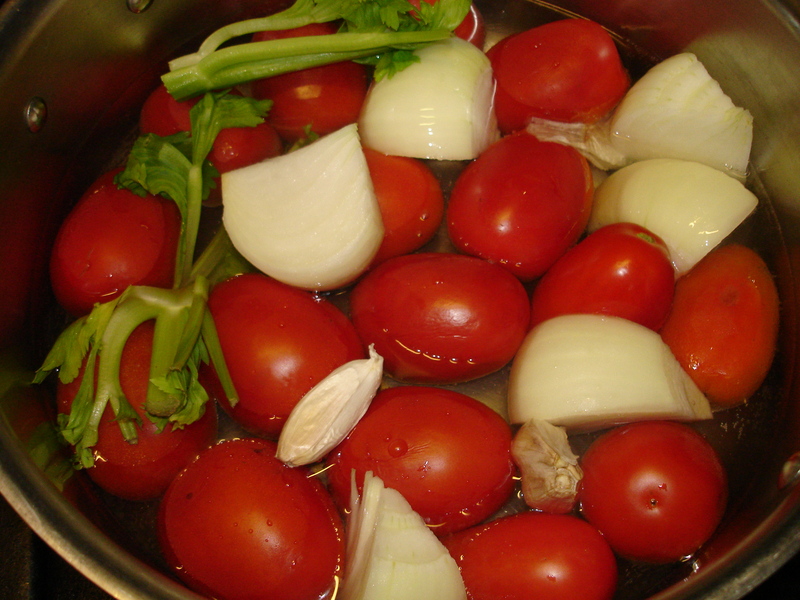 Add all ingredients into a stock pot with 5-6 cups water. Cover and bring to a boil. Reduce the heat just after the pot boils and simmer for 20 minutes. Turn the heat to low, use a slotted spoon to rescue the garlic and onion (if you dropped the onion with skin on, otherwise it will go with the other veggies); put these on your cutting board for a minute to cool. In the meantime, transfer the veggies to your blender and whiz them until chunky or go further for a smooth sauce. 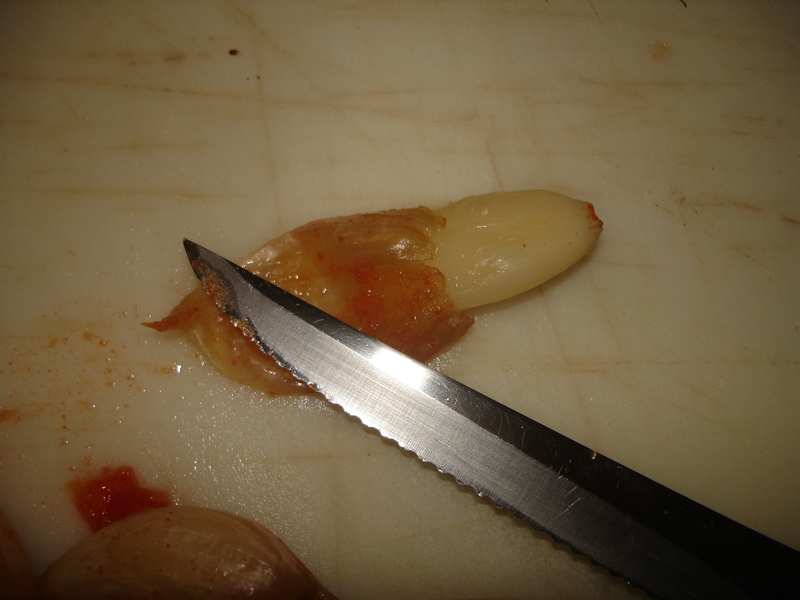 Now, press on the garlic cloves and let the soft garlic squish out. Add this to the blender. Do the same thing with the onion, if you left the skin on… it’s pretty cool how it works the same way! Add this to the blender too and whiz for a minute to blend everything. Add your diced zucchini or squash to the pot and cover with the puree. Bring the pot back to a simmer for 10 minutes. If you are serving your sauce with pasta, now is the time to drop it into the water. This is how I enjoyed the sauce. Post and let me know what you serve it with! 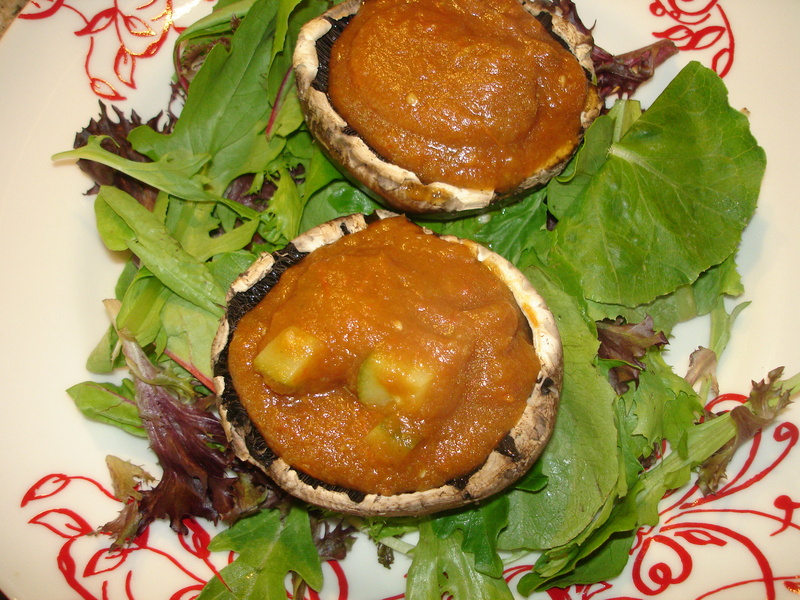 This entry was posted in Dinner, Family Friendly, mushroom, sauce, tomato, zucchini and tagged bumper crop, garden fresh, gluten free, quick, vegan. Bookmark the permalink.